she wasn’t merely trying to beat you down. SHE JUST DIDN’T KNOW. woodcuts, so both of you should be forgiven. an oyster against Mrs Darling. are not on hand. Try to fix your dates up so you can be. well use Choctaw for all I can understand. pardon (in your heart) for having been ignorant of woodcuts. Very unlikely you’re ignorant about oysters which are her specialty. 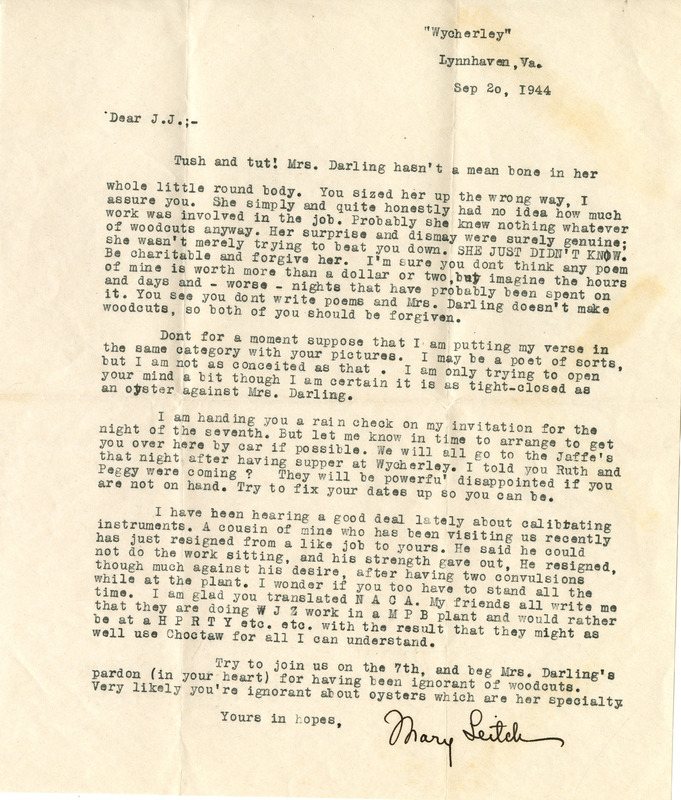 Leitch, Mary Sinton, 1876-1967, “Letter, Mary Sinton Leitch to J. J. Lankes, September 20, 1944 (Ms2017-001),” VT Special Collections Online, accessed April 23, 2019, http://digitalsc.lib.vt.edu/Ms2017_001_LeitchMary_/Ms2017_001_LeitchMary_B1F5_LeitchtoLankes_1944_0920.